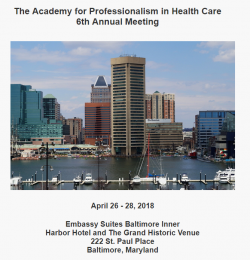 The 6th annual Academy for Professionalism in Health Care Conference will be held April 26 – 28, 2018 at the Embassy Suites Inner Harbor Hotel in Baltimore, Maryland. Participants in the APHC 2018 conference will be encouraged to consider the quality of resilience, and to explore its connections to the development and demonstration of professionalism in clinicians. While there are many definitions of the term, we understand resilience to be the process of adapting well in the face of adversity, trauma, tragedy, or significant workplace stress-all common components of a healthcare environment. The values of professionalism may benefit from clinician commitment to resilience, but it is unclear how or if this attribute can be cultivated.